Every year before spring training, projections are released for each team. There are many different projection systems for baseball, such as PECOTA, ZiPS, Marcel and CHONE. The one I'm concentrating on is ZiPS because its the most often referenced projection system. Also because FanGraphs uses it on their site and I use that one as much as I use Baseball Reference. ZiPS stands for "sZymborski Projection System", named for the creator of said system, Dan Szymborski. In this system, the simplest explanation is that it takes a player's recent past, finds players similar in age, crunches all sorts of numbers and spits out a projection for that player. I would imagine most projection systems are similar in that numbers are crunched and numbers are then spit back out without having been drenched in saliva. Rather than an in-depth explanation of how these systems function, we'll take a look at the projections for a few of the Mariners players from 2012 and see how it stacks up against their actual production. This isn't to debunk or in any way point out the faults in the system since I'm not even remotely qualified or smart enough to do so, but more to paint a picture with a very wide paintbrush and possibly just lifting the bucket and splashing the thing. If you want to see where I'm getting this information, you can go here and take a look at all of the players they projected. Most of the players on the list either didn't come close to reaching the number of innings pitched or at bats, and some didn't even get called up to the majors. That's not the fault of anyone, least of all the compiler of players that were projected. It's the nature of the beast and has no effect on any of the other projections anyway. I'm cherry picking the players to compare them with their projections to get the ones that were regulars throughout the season and see how they stack up. First on our list of 2012 projections is Kyle Seager. The 2012 ZiPS system said that Seager would get 572 at bats and hit .267/.323/.372 with an OPS+ of 93. Seager's actual production was 594 at bats, .259/.316/.423 and an OPS+ of 110. He also was projected for 32 doubles and actually hit 35 for the season. The only real outlier in Seager's production versus projection was his power. He was projected for 8 home runs and ended the season with 20. What can we take from this? The ZiPS projection for Seager was actually very, very close to Seager's actual production for 2012. His average and OBP were less than ten points apart between predicted and actual production. The biggest difference was the power, which nobody really saw coming in the first place. His highest home run total in the minors was 14 at High Desert in the A+ league. In 2011 in the majors, he hit 3 home runs in 182 at bats. Extrapolated out to the projected 572 at bats and 8 or 9 home runs on the season is about right. Seager went from one home run every 60 at bats in 2011 to one in every 30 in 2012. I don't care what kind of projection system you have. With what he did in the minors for his career while taking his 2011 major league time into account, expecting that kind of jump in production is ludicrous. Expecting it is nuts, yes, but he managed to do it and take a lot of people by surprise. 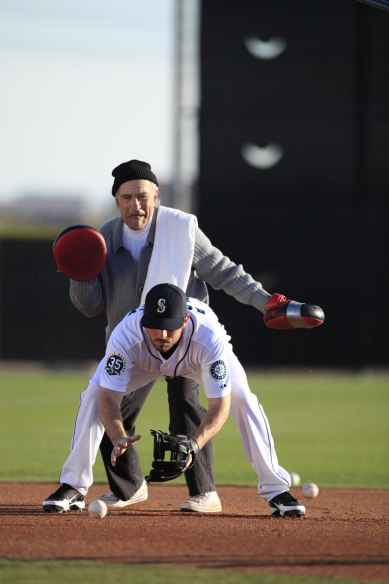 Next on the board is Dustin Ackley. His is a bit of a painful one to look at, but he's one of the few that had the playing time. For 2012, ZiPS projected Ackley to hit .261/.348/.410 in 610 at bats with an OPS+ of 111. His actual production was .226/.294/.328 in 607 at bats with an OPS+ of 79. As you can see from the numbers (and your own eyes if you watched throughout the season), he was nowhere close to those numbers. In every way possible, save for the at bats, Ackley did not get close to matching the projected numbers. He nearly reached the home run total with 14 projected and 12 actual, but fell well short in triples and doubles. For doubles, 31 projected/22 actual and triples, 9 projected/2 actual. It came out at the end of the season he was hurt for much of 2012, which probably hurt his production quite a bit. Between the one and a half seasons in the minors and another half season in the majors, a gap of that magnitude isn't surprising except maybe his average. By most, he was expected to be a #2 hitter with a decent average and high OBP, though even hitting .260 isn't all that great. His projected OBP was in line with what most people expected and indeed, even his actual numbers are close as far as the difference between average and OBP are concerned. Projection systems cannot predict injury and neither can anyone else. It's an unfortunate consequence to playing roughly 162 games a year and we'll have a better idea in 2013. Instead of another hitter that will just end up being depressing, let's move on to The King. Felix Hernandez was projected for 237 1/3 IP, 226 K, 3.00 ERA and an ERA+ of 131. Felix's actual numbers were 232 IP, 223 K, 3.06 ERA and an ERA+ of 122. To take a closer look, the following numbers are presented as projected/actual. H: 206/209, HR: 18/14, BB: 67/56. I'm not using wins or losses because the pitcher has no control over a team's offensive performance or lack thereof. This was actually the first time I took a look at Felix's projected numbers and compared them to his actual production. It's a little bit freaky how close the projections were to his actual production. His ERA and innings pitched are remarkably close, along with strikeouts, walks and hits given up. The thing to take away from Felix's numbers is his consistency. We already knew he was a work horse and one of the best in the majors and trying to quantify that would be fairly pointless. The thing to take away from this is that, while projection systems can be a lot of fun, they can't predict everything. Seager and Ackley are examples of that with Seager's power and Ackley's injury being the most obvious. Even so, with guys like Felix, consistency is still hard to predict, but it makes it a lot easier, especially with a guy who has been around for 8 years. That's not to say you or I could pull a bunch of numbers out of the air and get just as close as ZiPS did for Felix in 2012, but larger sample sizes DO make it easier. So when the ZiPS projections for the 2013 Seattle Mariners are released, don't take the numbers to heart. Its a projection system using a multitude of variables and there is always the chance a player finds his stride at the right time or rolls his ankle at the worst possible time. Looking at a player's predicted production for next season may give you an idea of what he might do, but nothing is written in stone.